No technological development has created more hysteria and hand-wringing in the ad industry than the adoption of the DVR. Over the past few years, the science department here at Ad Contrarian World Heaqdquarters has tried to counterbalance the intemperate ravings of pundit/lunatics by introducing some facts and perspective into the discussion. In my most recent post on the subject, I calculated that as a result of time-shifting and ad-skipping only about 3% of total spots were being missed. A recent study, however, leads me to believe that this may be a gross exaggeration. In fact, the true number may be as little as 1.2%. In a 3-year study by Duke University, in partnership with Information Resources Inc. (IRI), TiVo, and The University of Chicago, a sample of 1,588 households were studied to see, among other things, how they used their DVRs. What made this study different from other research done on DVR usage was that it measured actual behavior, not self-reported behavior. As you know, self-reported behavior is highly suspect and almost always turns out be inaccurate. According to Duke, the results of the study "...astonished the researchers." One of the key findings of the study was that 95% of the time people with DVRs were watching live TV. Only 5% of the time were they watching time-shifted TV. Let me explain in simple terms in case any art directors are reading this. Now remember, TiVo was first introduced in 1998. 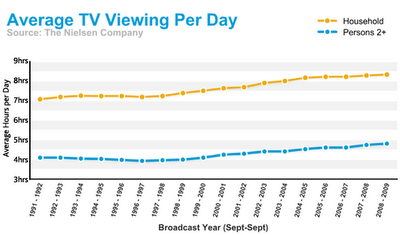 While all the wailing and panic about DVRs has been going on, TV viewership has increased. 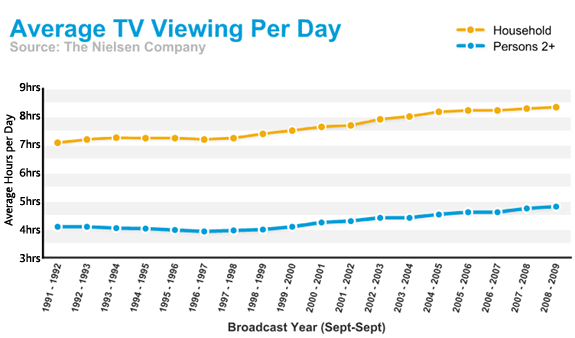 As a matter of fact, according to Nielsen, TV viewership has increased 21% since 1998. So, if the Duke study is correct, here's where we stand 12 years after the introduction of TiVo. DVRs are causing people to miss 1.2% of TV ads. Meanwhile, greater viewership is causing them to watch 21% more TV ads. The positive effect of more viewing is almost 20 times the negative effect of ad skipping. Why does no one report this? Later this week in "The Amazing, Invisible TiVo Effect, Part 2" we'll talk about what effect the DVR is having on consumer purchasing behavior. First I need to say that I don't know a thing about the break-up of Carmichael Lynch and Harley-Davidson. Next, I'm going to pretend that I do. Carmichael Lynch resigned the Harley-Davidson account last week. They had done terrific work for them for decades. While the client didn't say, "the world is changing and these guys can't give us anything new," and the agency didn't come out and say, "these knuckleheads don't even understand their own brand," my guess would be that these were the issues behind the break-up. Reading between the lines, it sounds like there was arm-wrestling over the brand personality. It sounds like Carmichael was fighting against diluting the Harley brand by trying to appeal to a "broader audience." In other words, the usual stupidity of trying to be everything to everyone. Or, more accurately, nothing to no one. The problem an agency faces when trying to protect a brand from itself is that it is labeled "incapable of coming up with something new and fresh." The more the agency tries to protect the client from tin-eared yahoos who are unwittingly determined to undermine the brand, the more they are stuck with this tag. This is particularly true when sales are lousy and advertising becomes the scapegoat. If, as I suspect, Harley tries to "broaden its appeal," what we will see is an instant replay of Saturn. An agency invents a brand. It protects and nurtures the brand. There is a bump in the road. The client panics. A new agency is brought in. The brand can't figure out who it is anymore. A funeral is held. In this case, however, the agency built such a strong brand, even tin-eared yahoos probably can't kill it.